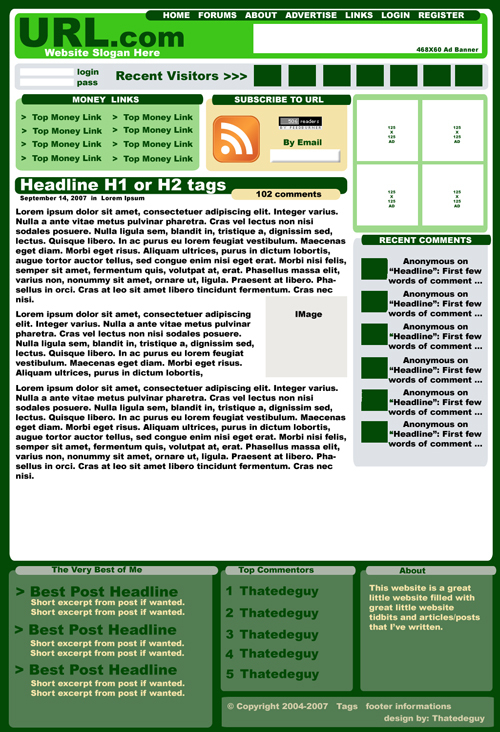 I created the Green Money PSD Layout for a contest on sitepoint. It didn’t win, so I thought that I would put it up here so that people could use it if they so choose. It isn’t coded, so you’ll have to code it for whatever backend you choose to use. I tried to position things such that they are in prime locations with emphasis on the subscribe section as well as the recent comments and recent visitors sections. I also tried to label the layers appropriately for easy finding and editing. If you end up using the layout, I’d like to request that you leave the “design by thatedeguy” part and also link it to this page. I’d also like to hear from you so that I can put up a link to the pages that use the layout, here. You can click on the thumbnail to see the layout a little closer and you can download it below. If you do download it, please consider making a donation via paypal. I don’t know what the layout is worth to you. The contest was for $250, but I’m sure that it’s value to you is varied. If you think it’s worth $5 or $50 or $100, then that’s what you can make a donation for. Heck, if you think it’s worth nothing, you can donate that much too. Of course, if you think it’s worth nothing, then why are you using it?